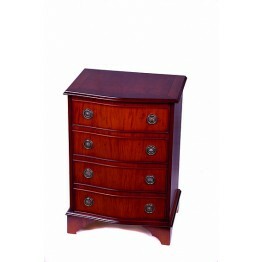 Choose a stylish chest of drawers from our reproduction furniture range which is avialable in different sizes, widths and depths and will enhance any room within your home or even match existing furniture. The classic styles include Queen Anne, Classic and three, four or five drawer standard sets which are available in Mellow Mahogany, Mahogany, Yew, Cherry, Rustic Oak and Honey Oak too. Why not invest in other items within the reproduction furniture range. We may even be able to offer a discount when you spend over £2000. This is a regency style chest of 4 drawers with a serpentine front. This serpentine design means tha.. This is a regency style chest of 3 drawers with a serpentine front. This serpentine design means tha.. This is a regency style chest of 5 drawers with a serpentine front. This serpentine design means tha..